This Demonstration presents an expanded version of the magnitude estimation method used to assess the perceived intensity of physical and chemical stimuli by humans or their preference for a product. It is based on the individual subject or panelist's assessment, not as a single number or equivalent length, but as lower and upper limits of a range. This is followed by Monte Carlo simulations to produce the mean response and its standard deviation. These can also be computed directly from the entered ranges' limits. If the entered minimum equals the entered maximum in all the evaluations, this reduces to the traditional method. 1. By Monte Carlo simulation, generating and averaging of numerous combinations of values chosen randomly from within the respective intervals. The mean and standard deviation of this generated data are considered as those that correspond to the specified ranges. 2. Analytically, using the formulas and , where is the number of evaluations. The term is the variance of a continuous uniform distribution with a domain from to . The number of Monte Carlo random trials , the seed value, and the and are entered with sliders. The evaluations are activated by clicking a checkbox, as is the use of the entered seed's value. In order to produce new random trials with exactly the same parameter settings, first click the "clear" button and then the "generate" button. 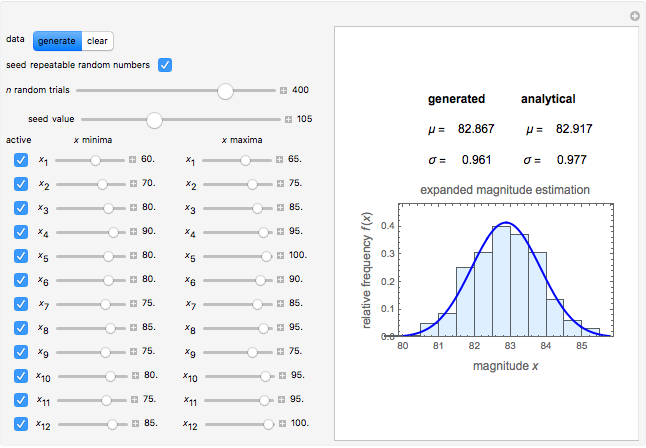 The output includes the mean and standard deviation values calculated by the above two methods, the histogram of the values generated by the Monte Carlo simulations, and a plot of the normal distribution that has the same mean and standard deviation as the generated data. 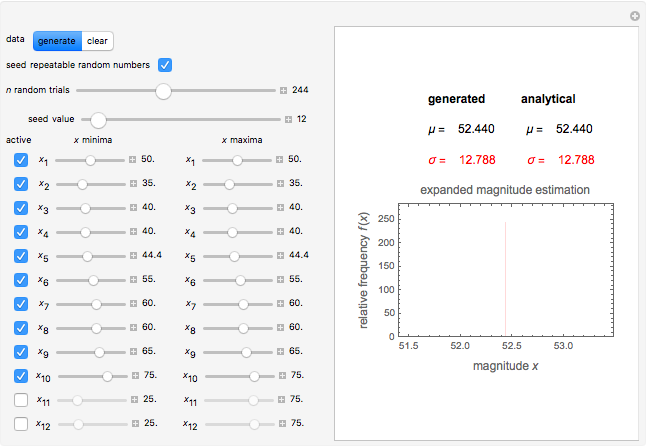 When all the are equal to their corresponding , this is equivalent to the traditional magnitude estimation method. The histogram in this case consists of a single bin, and the standard deviation value is to be printed in red. 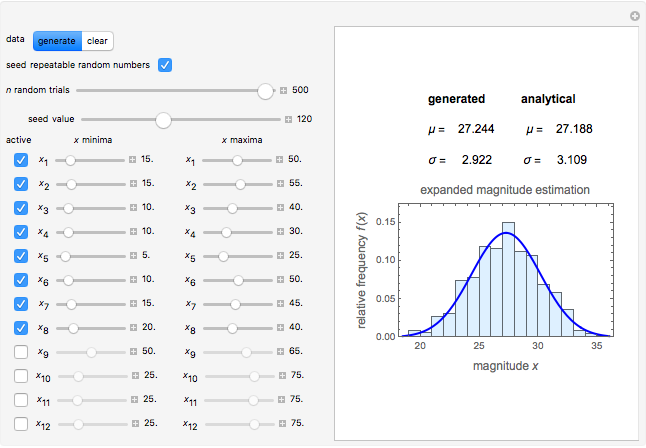 Mark D. Normand and Micha Peleg "Expanded Magnitude Estimation Method"